Assuming a Si-Boron P-type, and Si-Phosphorous N-type solar cell. N-type is on top and P-type is bottom. I understand that after both semiconductors are layered a depletion zone is formed. Where e- from N-type move to P-type. This results in an electric field. Then I'm not clear what happens. Photons come in through the N-type and strike atoms where exactly? Are they striking Si, P, or B, and in which part of the PN junction. When a silicon photodiode or photovoltaic cell is exposed to visible light, for example a solar spectrum where almost all of the intensity is well above the band gap, the conversion of photons to electron-hole pairs starts right at the front entrance, and decays exponentially inwards. It's then the job of diffusion, plus any electric fields produced by self-bias (due to doping) or externally applied bias (in the case of biased photodiodes) to separate the electrons from the holes so that each can be collected at one of the electrodes. The P-N junction produces a natural electric field within the silicon, and results in the drift of the electrons in one direction and the holes in the other. 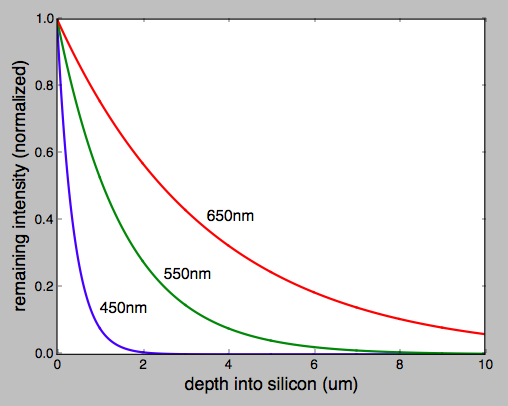 From PV Education.org's Optical Properties of Silicon we can see the absorptivity is very strong for blue light around 450 nm, and much weaker for red light at 650 nm. The most likely place for photons to be converted to electron-hole pairs is always the entrance face of the silicon, but the average depth is a strong function of wavelength. 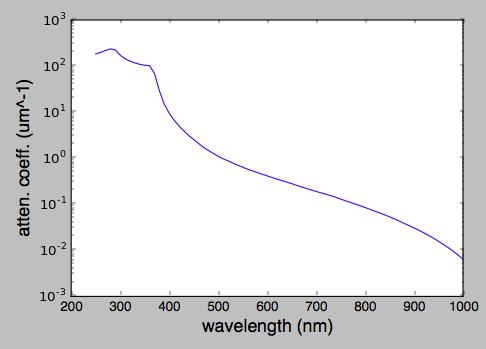 Here's a plot of the normalized conversion rate based on this simple model for three different visible wavelengths. Most of the power available to silicon in sunlight is within this range. Not the answer you're looking for? Browse other questions tagged atomic-physics electronic-band-theory photovoltaics or ask your own question. Band Gap/Energy Bands in Semiconductors? How do photons know they can or can't excite electrons in atoms? Can a single photovoltaic semiconductor junction ever produce a voltage much above it's own band gap? How is it possible that heat may excite electrons even though it is a continuous energy source? How is a Potential Difference Created in Photo Voltaic Cells? How can photons excite multiple atoms in a szintillator?